Waste water is collected and leaves your house via the plumbing system and enters into the septic tank. The tank holds the liquid and solid wastes for the primary treatment which is the separation of those solids and liquids by gravity. The heavy solids, commonly called sludge, accumulate at the bottom of the tank. The lighter greases and oils, called scum, float to the top of the liquid. Bacteria partially decompose the sludge in the tank and reduce the amount of solid material by about 60%. Gases generated as a natural part of the decomposition process are released through plumbing vents. The liquid in the tank, called effluent, flows by gravity to a header or distribution box. The header or distribution box evenly distributes the effluent from the septic tank to the drain-field. The drainfield is a system of chamber like sections with perforation set about 18" on the average, underground in a bed of FS Sand that allows the effluent to seep slowly into the ground. The effluent undergoes further treatment in the absorption bed. Naturally occurring bacteria and the filtering action of the sand reduces, but does not eliminate, the pollutants and levels of potentially harmful bacteria and viruses. The effluent continues percolating down through the soils until it reaches the groundwater. The effluent is then diluted by mixing with the groundwater and flows away from the site with the underground flow of water. The treatment efficiency of a septic tank soil absorption drainfield system is approximately 50% as compared to 90% for wastewater treatment plants. Many chemicals pass through the system without being reduced in concentration. Toxic organic and inorganic chemicals, bacteria and viruses in the effluent are released to the groundwater system. Many household chemicals cannot be treated by septic tank systems and should not be disposed of down the drain. For example, gasoline, paints, and pesticides. In Broward County, many non-sewered industries have been found to have contaminated the groundwater with toxic chemicals. DPEP has been investigating the impact to ground and surface water from septic tank systems. In one recent study, high levels of contaminants were found in the groundwater underlying an industrial area and a residential area serviced by septic tanks. According to DPEP, what can you as a home owner do to help protect our water resources and the public health? 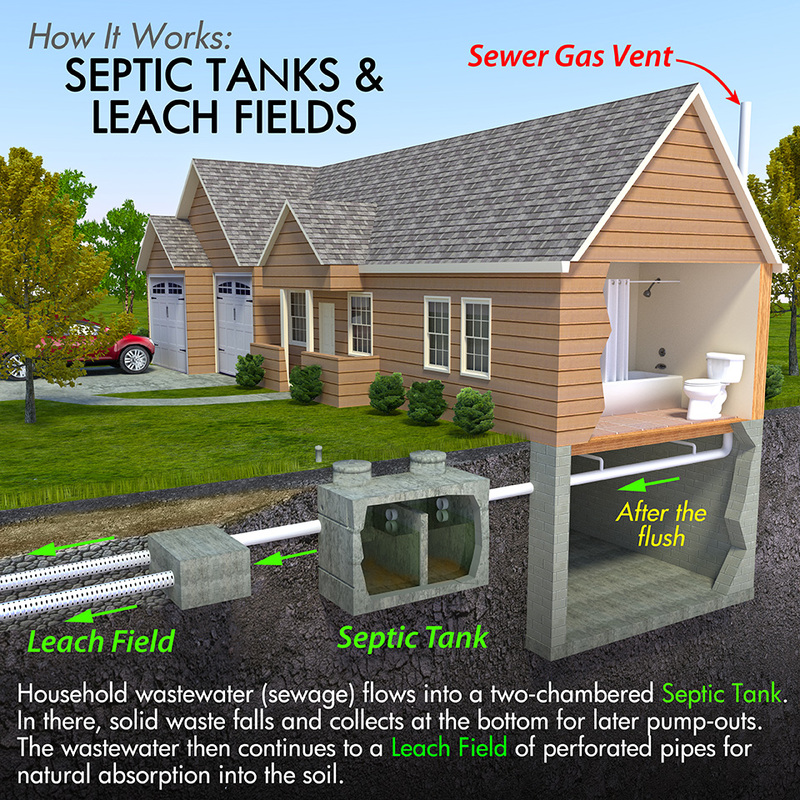 DO YOU HAVE A SEPTIC TANK SYSTEM? A little investigation may be necessary to find out if you have a septic tank system. Contact the Department of Planning and Environment Protection. Please call 5191270. Maps of known septic tank areas have been recently completed; we should be able to tell you if you are on a septic tank. Check your utility bill to see if you are being charged for wastewater treatment. If you are not, then you most likely have a septic tank system. If you are being charged for sewers, it means that your servicing utility has installed a sanitary sewer collection system in your area and sanitary sewers are available for your property. In most cities connection to sanitary sewers is required and enforced. Contact the collection services division of the local servicing utility. Ask for their assistance in determining if your property is connected to a sanitary sewer. Ask if connections are required and if that requirement is enforced by your utility. If not enforced, then you may still be using a septic tank system and should continue your investigation as suggested below. If you determine that you do have a septic tank and sewers are available you should call your utility customer service and inquire about getting connected to sanitary sewers. Contact your local building department. They may be able to provide a record of the building permit that was required for the plumbing work needed to connect to the sanitary sewer lines. Hire a qualified and state registered septic tank contractor by the name of Johnson Environmental Services to assist you in your investigation. Johnson can determine if you have a septic tank system and conduct an inspection to determine if it is in good operational condition. Or find it yourself. Generally, septic tanks are located at a depth of two to four feet. The tank must be at least five feet away from the foundation of the house. Look in an area that is not obstructed by large trees, property lines, patios, etc. By probing the ground with a metal rod, you can usually locate the typical concrete septic tank.If the concrete is broken up into pieces, chances are that the tank has been intentionally destroyed, as required, and connection to the sewer main has been made. A major advantage of the septic tank is that it has no moving parts and needs very little routine maintenance. If properly operated and maintained the system should work for about 10 years to 20 years. But there are problems that may show up in the house plumbing, the septic tank, distribution pipes, and the soil absorption drainfield over time or if the system is improperly operated or maintained. The most common problem with septic tank systems is a failure of the soil absorption drainfield. The symptoms of a failed drainfield are many Sewage backups in the house plumbing or sluggish flow is either caused by a clogged pipe or a failed drainfield. Even if the sewage does not back up in the house plumbing, a drainfield that may not be functioning properly and the effluent may rise to the surface of the ground or enter the groundwater at too fast a rate. In either case, these types of failures can also be a threat to public health and potentially cause degradation of the water quality of nearby lakes, canals, and groundwater. For example, pooled effluent in your yard can be a health hazard to your children playing in the area. Also, it can be washed into nearby lakes, canals, rivers, and waterways where it may cause a hazard for those swimming' there. It may also impact the ecology of the water body. It is estimated by the Environmental Protection Agency that as many as one-half of all existing septic tank-soil absorption systems in the United States are not operating satisfactorily. Over time, all drainfields will fail because the capacity of the soil to absorb effluent has been exceeded. The soil becomes clogged and the effluent will rise to the surface of the ground. However, premature failure most often results from failure of the home owner to periodically pump out the sludge from the tank. Sludge builds up in the tank and is eventually carried into the drainfield where it clogs the drain-field pipe. Water then backs up in the system or rises to the surface of the ground. Failure of the soil absorption drainfield may also occur without any visible symptoms. In this case soils are rapidly overloaded with organic and inorganic chemicals and bacteria, which permits rapid movement of contaminants to groundwater. Leaks directly from the septic tank may be less apparent than failed drainfields but can also lead to problems. If tank leakage causes the level of the scum layer to drop below the level of outlet structure, excessive scum discharges can cause failure of the drainfield. In the extreme case, the sludge layer in the bottom of the tank will dry out and compact, and normal tank cleaning practices will not remove it. Another problem occurs when the tank is not watertight and allows rain water to seep into the tank. This causes an overloading of the tank and can lead to a clogged drainfield by the rain water pushing the solids into the drainfield pipe. Low spots in the area above or near the drainfield. Obnoxious odors ranging from a musty odor to a rotten egg odor to raw sewage odor. The grass is much greener and lush above or near the drainfield. Soggy grass in the area above or near the drainfield during dry periods. Sluggish flow when flushing the toilet. Backup of sewage in house plumbing. WHO DO I CALL FOR HELP IF I HAVE A PROBLEM? Johnson Environmental Services is a full service business located in Oakland Park, Florida. Services are performed daily in Miami-Dade County, Broward County and Palm Beach County. The company performs expert service including the installation, pumping, jetting, cleaning, repair, inspection and modification of Septic Tanks, Drainfields, Grease Traps, Lift Stations, Sewer Lines and Storm Drainage Systems. Additionally, Johnson Environmental performs Video Pipe Inspection and the Rehabilitation of plumbing lines, sanitary sewer lines and storm drainage pipes.